Britain does seem to have a vast amount of traditions that appear throughout the year. 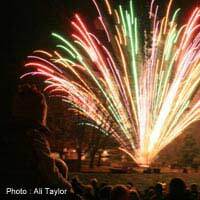 Bank holidays and Guy Fawkes Night are only a few of the many traditions that are celebrated throughout the UK each year. Like many countries Britain has some very strange traditions that take place throughout the year. Many of these traditions date back centuries and have religious and political origins. Not all of these traditions are practiced throughout the entire UK and many are specific to certain regions. But whether it’s cheese rolling in the Cotswolds or dancing around the maypole there is sure to be some form of tradition taking place throughout the year in the UK. One British tradition that is celebrated throughout the UK is Guy Fawkes or Bonfire Night. This tradition dates back to 5th of November 1605 when Guy Fawkes, an English Catholic Restorationist decided to blow up Parliament. Fawkes along with other Restorationists planned to overthrow the protestant government with this daring exploit. The attempt was thwarted when an anonymous letter was sent and the gunpowder was found in the Parliament cellars. Guy Fawkes Night is celebrated by burning bonfires with dummies, known as Guys, on top of bonfires, and with fireworks displays. A number of traditions are held every year in Britain during the month of May. The 1st of May, known as May Day, is a time of celebrating springtime fertility. Dancing around the Maypole, Morris Dancing and crowning the May Queen are all common traditions on this day. May is also the month of two bank holidays in the UK, usually the early bank holiday on the 3rd of May and the spring holiday on the 31st May. Bank holidays are recognised as national holidays in the UK; this orginated when banks were shut for the day and no other businesses could operate. Bank holidays vary from country to country in the UK but the Bank Holiday Act was introduced in 1871. Cooper’s Hill Cheese Rolling is strange tradition that was started at least 200 years ago and now attracts thousands of spectators. This tradition is held on the late May holiday at Cooper's Hill in the Cotswolds. It basically involves rolling a seven pound double Gloucestershire cheese down a steep hill with participants running after it. Cheeses can reach speeds of 70 mph and serious injuries can occur. The origins of this tradition are unknown but one theory is that Romans threw missiles down Cooper’s Hill. Scotland celebrates Hogmanay at the stroke of midnight on the 31st of December when house guests will turn up with lumps of coal or whiskey. This is known as ‘first footing’- the first person to step over the door in the New Year. If the first foot is tall, dark and handsome this is supposed to bring extra luck. Hogmanay celebrations in Scotland include the famous party in Princess Street in Edinburgh and celebrations can last for days. Many Scots begin the New Year with resolutions never to drink again after over indulging in the New Year celebrations. The 31st of October is the date that Halloween is celebrated in the UK before All Saints Day on the 1st of November. Halloween is thought to have originated from the Celtic festival of the dead. Traditions include carving faces out of pumpkins, bonfires, ducking for apples and dressing up as witches and demons. Trick or treating is another tradition where children knock on doors asking for treats, and if refused will commonly cause mischief. Trick or treating is sometimes referred to in England as Mischief Night. Christmas Day is popularly regarded as the most important holiday of the year in the UK. Traditions include braving the icy waters of local rivers and lakes with a swim. The Christmas Morning Swim has become a tradition that takes place all over the UK by brave, some say foolhardy, swimmers. The Peter Pan Swim in the Serpentine Lake in Hyde Park dates back to 1864 when J.M. Barrie the creator of Peter Pan presented the Peter Pan Cup. In Sandy Bay in South Wales around 1000 people take to the near freezing waters for their annual Christmas morning dip. There are literally hundreds of strange traditions and customs practiced in the UK throughout the year. Many of the origins of these traditions have been lost over the centuries. But these traditions will no doubt be kept alive for centuries more by British people the world over as a reminder of past times.